Pity the poor Smith-Pickles, left to look after Uncle Morton’s dragon while he is off on holiday. 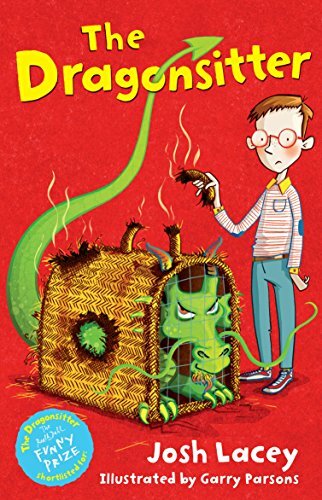 With Uncle Morton’s instructions on how to look after the dragon scant to say the least, the whole experience rapidly descends into chaos, with burnt curtains and carpets, piles of pungent dragon poo in Mum’s bedroom, and a very nasty end for poor Jemima the pet rabbit. The ongoing situation is recounted to the reader via a series of increasingly desperate emails (complete with illustrated attachments) sent over the course of the week from young Eddie Smith-Pickles to his uncle. This clever narrative device works brilliantly well here: it’s simple, economic and immediate. Not until Friday, by which time Mum is well past the end of her tether and the postman is threatening to sue, does Uncle Morton reply. His silence, both baffling and ominous, is echoed by the dragon, a silent presence in Garry Parson’s illustrations. This magnifies the sense of relief we feel when Uncle Morton finally replies, and heightens the absurdity of his response: he suggests Eddie tries chocolate. This is a witty and perfectly formed little book that deserves to be read and reread: it packs an extraordinary amount of fun and adventure into its 64 pages and will be enjoyed by readers of all ages.